In 2018, three Global Streets partners worked with the French company L’Homme Debout to create Rise!, a large-scale procession able to embed locally-authored stories within an overarching narrative and to involve local participants in the production in a range of ways. FESTIVAL.ORG worked with the company to shape a storyboard for Rise! and to identify different ways in which community engagement could be woven into the show. 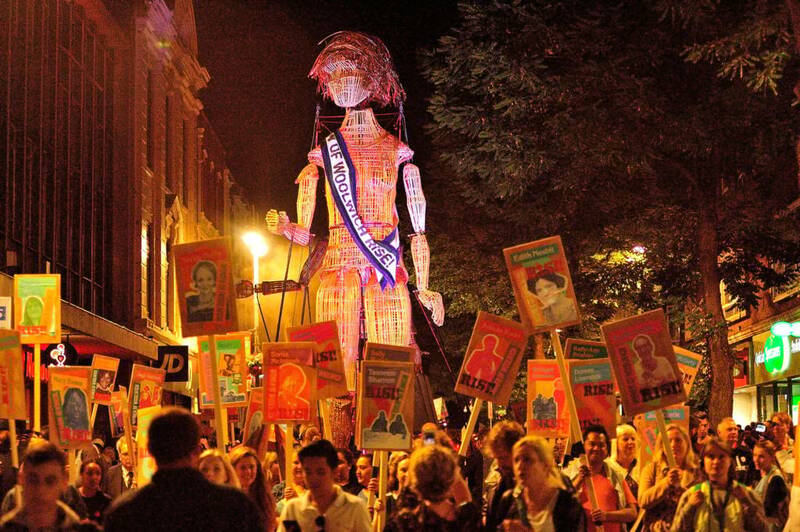 Featuring the company’s trademark large-scale puppets, the resulting production was built around the idea of a woman arriving in a community and passing on what she has learnt on her travels to a young girl, celebrated both the local and global contribution of women, and marking in turn the centenary of the Representation of the People Act, the law that allowed some women and all men the right to vote in the UK. 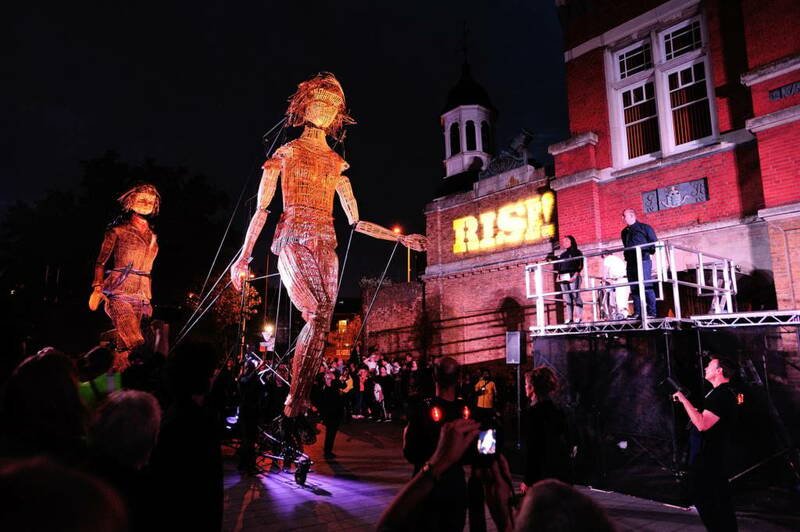 Premiering on 23 June as part of the Greenwich+Docklands International Festival, the first performance of Rise! in Woolwich was built around a celebration of almost 100 diverse Woolwich women and non-binary people nominated through a community campaign, these stories shared during the procession through a series of large, specially-commissioned placards. The performance also featured performances by local groups B40 Youth Dance Company and Nupur Arts, whilst the visiting puppet was welcomed to the town by Cllr Denise Hyland, the former leader of Royal Greenwich Borough Council, and with a commissioned poem by local poet and activist Rasheeda Paige-Muir. Later in the summer, Rise! moved on to Hull, where as part of the annual Freedom Festival the parade celebrated the rise of the city and all that live there. Among a wide-ranging engagement programme, Freedom Festival commissioned artist R M Sanchez-Camus (Marcello) to develop the Print Shop. Through a series of community-based workshops and a week-long residency in a vacant unit in the city centre, Marcello worked with a diverse range of over 1,000 residents to craft personal slogans, printing these statements onto t-shirts, placards and banners that were featured in the Rise! procession. And finally, in October L’Homme Debout visited Luton, where RevoLuton Arts focussed exclusively on engagement in response to the theme ‘United we stand, Together we rise’, again in celebration of the rise of the town and those who live there. 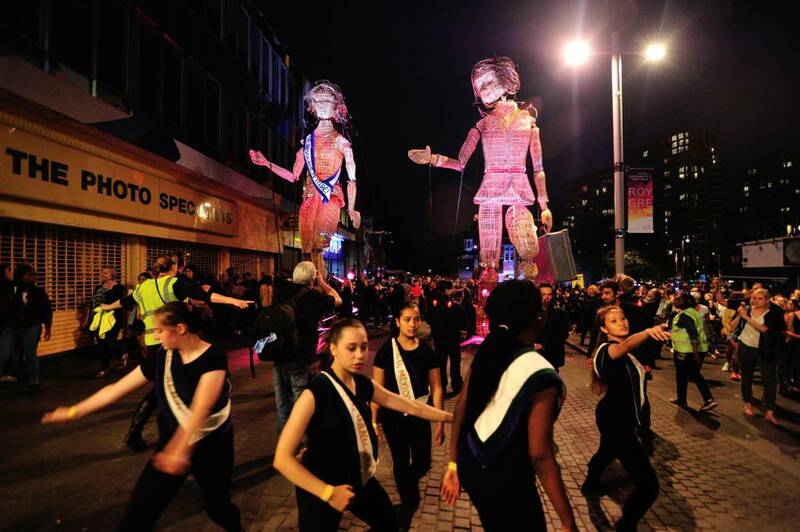 A young rap artist from Luton, Shifa Choudhury, welcoming the visiting puppet in the midst of the performance and a massed dance, choreographed by Jean Abreu, was shared in advance through workshops and online, drawing the parade to a shared close.  Reaching audiences of between 2,000 and 5,000 and engaging with up to 1,200 participants, Rise! marked a step change in the way that Global Streets is developing work that delivers against the particular performance and engagement aims and objectives outlined for the programme. The performances have already inspired a couple of legacy projects – the placards and t-shirts were a regular feature throughout the rest of the Freedom Festival and an exhibition of the Woolwich placards ran in community venues over the Autumn of 2019 – and plans are in train to bring the production back to the UK in 2019. Six different communities across the Liverpool city region and Chinese people living and working in city centre Birmingham collaborated with French artist Olivier Grossetête over the summer of 2018 to realise the collective building of local landmarks, some long lost, others yet to be imagined. Located in the midst of Birmingham’s Chinese Quarter, Global Streets partner Birmingham Hippodrome wanted to develop a large-scale project that would enable the organisation to connect with its local Chinese community. Unlike London and Manchester, Birmingham’s Chinese Quarter doesn’t have the grand statement of a Chinese arch at the centre of the community. 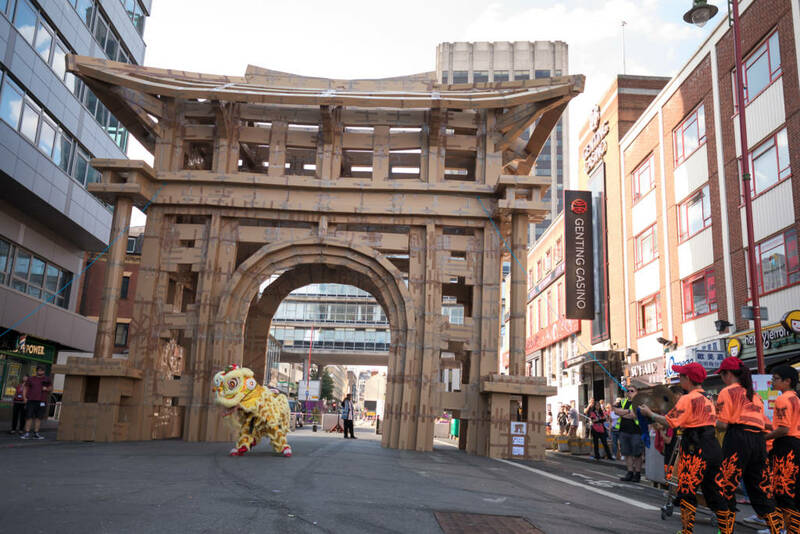 The Hippodrome worked with Olivier to conceive a giant cardboard Chinese arch that the community could build together. Over one week, 21 box-building workshops were delivered in a local Chinese restaurant venue, the Huan Gate, with over 400 participants from the local Chinese Community Centre and a range of Hippodrome engagement partners. With the basic building blocks in place, the final construction of the arch took place on Saturday 14 July, attracting phenomenal engagement with over 1,500 participants assisting in the build – including local Chinese residents, visitors attending the Summer in Southside festival, a number of hen and stag parties, a rugby team, football fans and even the local homeless community. Around 1,000 people then enjoyed an artistic programme the following day, featuring street dancing Stormtroopers, Bostin Brass and Chinese Lion dancers performing in front of the arch – before it was finally pulled down and squashed by a swarm of children, their parents and carers, and many of our festival artists, volunteers and Hippodrome staff. In total, around 5,000 people enjoyed the experience over the two days and the resulting ongoing conversation with Chinese community has already led to further projects around the Chinese New Year in 2019. 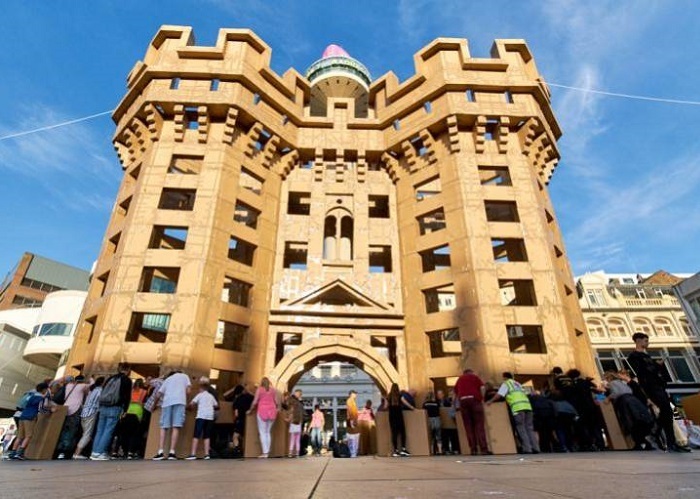 Later in the summer, Olivier Grossetête worked with over 2,000 participants across six Liverpool boroughs to recreate huge castles out of cardboard boxes which once stood in those communities. Prior to the building, all six boroughs facilitated four days of workshops for volunteers to work with Olivier Grossetête’s artistic team to help create the cardboard structures. Over two further days, community volunteers built the structures, each one taking roughly 13 hours to complete. A full day of free artistic events was programmed in and around the six castles, including storytellers and street entertainment, live music and theatre performance as well as demonstrations and creative engagement workshops. On the following day, each castle was demolished by the same public who had constructed it. 110,717 people came to see the castles, and the project won a Liverpool Echo Award for Community Event of the Year. 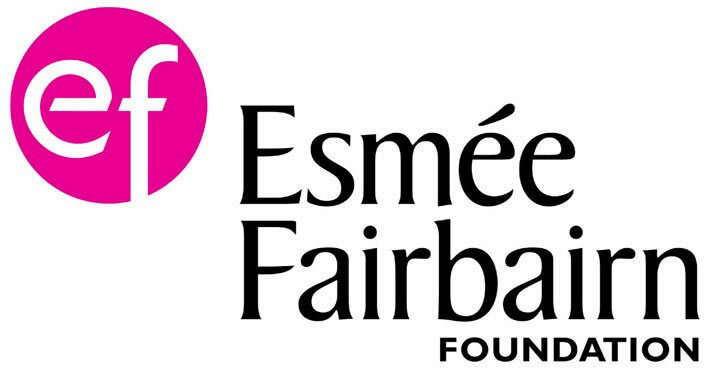 Of those who participated, 130 are now engaged in developing projects with organisations this year. Undoubtedly a huge success in terms of participation, audience engagement and broadcast reach, Lost Castles kickstarted a new approach to outdoor arts and cultural engagement across the Liverpool city region, including a new ‘Creative Conversations’ group set up with representatives from communities in each of the six boroughs to develop a new engagement strategy for ongoing cultural content.